The Grand Tournament expansion has released for Hearthstone and you can bet that I’m taking a close look at all of the new cards and writing up on which cards are most worth having. 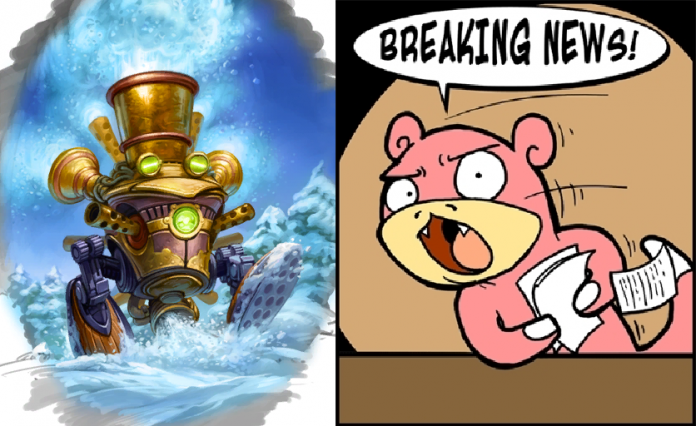 However, it’s going to take some time for the new meta game to settle and for the best cards to show their true colors. In the meantime, now seems as good a time as ever to look back on the last major expansion, Goblins Vs Gnomes, and how it affected the Mage class. We’ve already covered the best Mage cards from the classic set, but it’s about time we gave GvG its due. This one only gets fifth place here as it’s only good in mech decks, so he’s not worth having unless you also have plenty of mech cards to go with him. 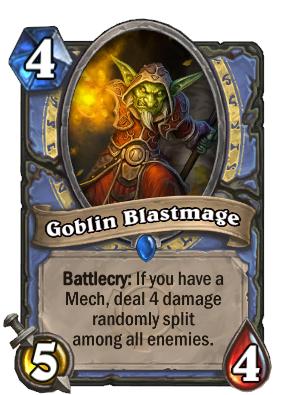 However, he is a must in any Mech Mage deck. A 5/4 for 4 mana is a decent enough body and his effect, while unpredictable, can easily give you a huge lead. He can soften up larger targets for your minions or spells to finish off or wipe an entire swarm of smaller minions. The only thing to really consider is knowing how to properly prepared the board before playing Blastmage inorder to maximize your chances of getting good value out of him (e.g. if there’s one big enemy minion that you can kill without the Blastmage and a few smaller ones, kill the big one first to reduce the chances of wasted shots). 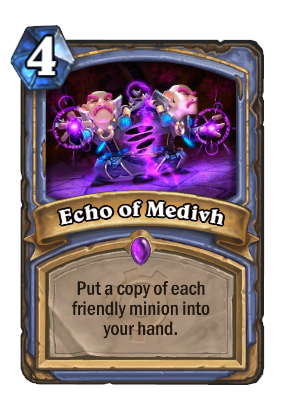 While it’s not as apparent as with Goblin Blastmage, Echo of Medivh needs to have specific decks built around it in order to truly be worthwhile. However, used in the right deck and played at the right time, it can give you a massive advantage with a strong supply of minions. Given its 4 mana cost, you’re going to need to get a few good minions out of it in order to have an impact on the game. One especially crazy strategy is to play a high-risk Mage deck with Molten Giants and swarm the board with free giants when your health is low and then catch up on defenses with Sunfury Protector and Ice Barrier, but that’s not a tactic you’ll be able to easily put together on a budget. Still, even a lackluster board can make great use of Echo of Medivh as the simple ability to maintain a board presence is where this card truly shines. This is especially potent in the arena where board presence is everything. The only time it’s truly bad is if you only have one smaller minion on the board and end up spending more on the spell than the actual minions it created. Otherwise, it’s a great card across a number of different Mage decks. 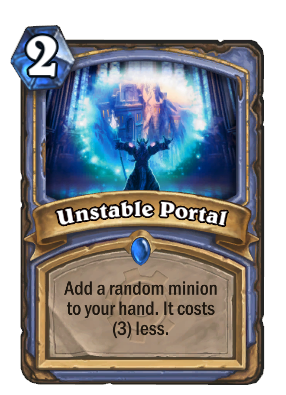 There may be a massive amount of randomness involved with Unstable Portal, but time has shown that it is definitely a dice worth rolling. What makes it such a powerful card is that it discounts whatever minion it generates by 3 mana and that discount lasts until the card is played. If you get anything worth 3 mana or more, you get to play it earlier than you normally could and that can give you incredible board control and leave your opponent fighting an uphill battle. Even if you only get a 2-drop, that is still decent enough for what you put in for it. The only risk is overpaying mana for a 1 or even 0 mana minion or getting a minion with an effect that would work against you. As such, you should treat the portal as card draw and save it for when you have spare mana or no better plays. The odds of it whiffing are minute compared to the incredible possibilities available. Against any class that relies on attacking with the hero to maintain tempo, such as Warrior, Rogue, and Druid, Snowchugger is an absolute nightmare. 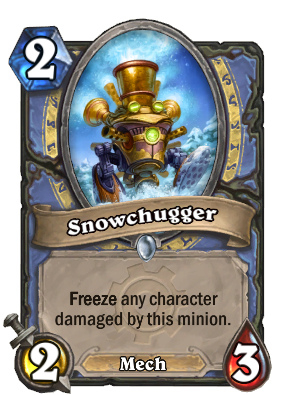 While a 3/2 for 2 is usually better than a 2/3 for its ability to trade up with most 3-drops, Snowchugger is made better by its focus on durability as it allows you more of a tempo lead as you freeze your opponent early on. Even without the mech typing, this card would already be a powerful early-game play that can also help keep you going if drawn in the late game. Add a mech type and you have an incredible versatile minion. While there may be some randomness involved with Flamecannon, its ability to level even mid-game minions at such a low cost is well worth it. 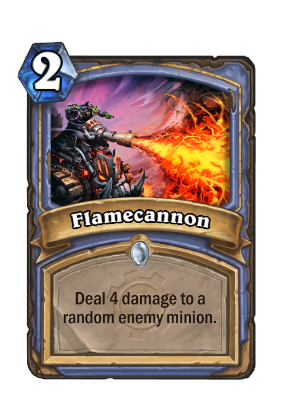 The key to Flamecannon is keeping control of the board and reducing the amount of randomness involved with this spell. Trade up on smaller targets first and then use Flamecannon to shut down remaining threats. Played carefully, it can seal control of the early game in your favor and leave your opponent fighting an uphill battle with little effort. It’s also worth noting that it works best in combination with Frostbolt rather than as a replacement for it. Along with a few cheap minions, you can easily take an early lead you’re not likely to lose. If you’re wondering why the Mage’s legendary card for GvG, Flame Leviathan, is missing from this list, it’s because it’s actually an extremely weak card. While legendaries like Antonidas and Jaraxxarus are incredibly strong, the hardest cards to find aren’t always the best. In fact, there are plenty of legendary cards that can’t hold a candle to a good common. Legendaries are most notable for having the flashiest effects and only allowing one copy of it per deck as opposed to the usual two, but that doesn’t always translate to an practical card. Flame Leviathan is an example of a card that is far too unpredictable, is liable to put you in a worse position than your opponent, and simply doesn’t fit well with just about any deck. The most powerful cards will always be the most sensible ones rather than the ones that aim for style points, and keeping that in mind will guide you towards the best strategies. Be sure to keep your eyes on VgamerZ for more on building your Hearthstone collection.